Ecology is all around us. This might seem like an obvious statement, but it is too easy to overlook in the modern world. Since the 1960s, ecology and environmentalism have been so closely linked that we may tend to think of them as being the same thing. And therefore we think too big. We think in terms of saving the world. To many people these days, ecology means issues such as the hedgerows bill, summer wildfires in forests and heathered fields, or the depletion of our ocean resources. These larger issues are indeed important, but they are so big, and so far away, that they become abstract. By thinking of ecology only in such grand terms, we risk losing sight of the ecology we move through every day. We become unable to see the trees for the forest, to coin a phrase. By thinking of ecology only as something that is elsewhere, we lose our personal connection with the world. Ecology simply means the relationship of living things to one another and to their physical surroundings. The word comes from the Greek oikos, ‘house’ — it literally is the study of where we live. In the city, we might feel cut off from nature. Instead of field and forest, we live amongst pavement and buildings. But the concept of ecology reminds us that we are connected to nature no matter what. And nature exists just as much in a single tuft of grass on the side of the road as it does in an entire field, if we can only find the time to stop and look. I run the path along the Corrib River from the main NUIG campus out to the athletic fields across from Menlo Castle, a route that takes me through woods and past reeded river mudflats. Birds accompany me the whole way, and depending on the time of year, I encounter the heady smell of wild garlic, the intense aroma of wild meadowsweet, the deep hidden purple and bold bright red of lords-and-ladies hidden amongst lush green leaves, the white flowers and then the rich bursting flavour of blackberries (if I can ever get to the ripe ones before the birds do). Butterflies and dragonflies flit through the air, and unseen creatures rustle through the ground litter as I run past trees, shrubs, earth, each with its own ecosystem and together a greater whole. Here, isolated and yet still so close to the city that I can hear the traffic on Newcastle Road, the air is fresher, and the world feels more alive. And so do I. But we don’t need to remove ourselves to such dedicated ‘natural areas’ for a personal encounter with ecology. 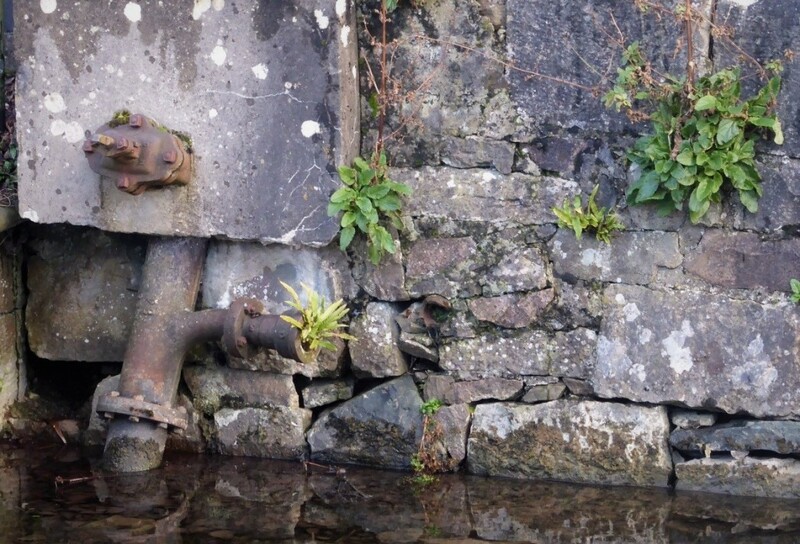 Trees grow out of the riverwalls of the city, testifying to the tenacity and enduring nature of Nature. Bellflower grows out of every stone wall, and moss hides in the shadows. 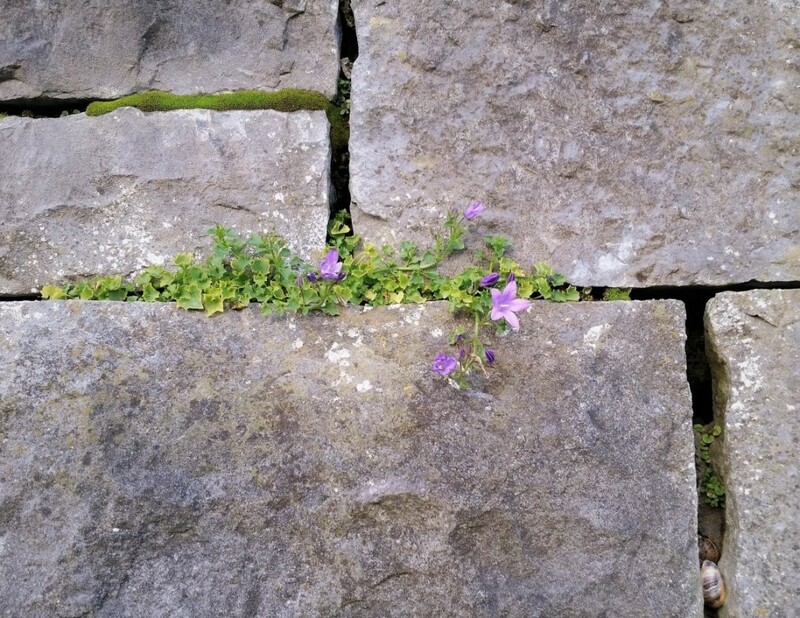 A single ‘weed’ growing out of a crack in the pavement is in reality a wildflower hosting an ecology of its own; insects feed on it, and a ladybug feeds on them. Unseen underneath the earth, the roots host another world of life. Birds, of course, abound everywhere, including in the city. But even here in Galway, we can also see seals in the Bay and the mouth of the Corrib, and otters up and down the River and the canals. Lizards, frogs, beetles, snails, voles, and hedgehogs hide in our gardens. Sometimes, though, it’s all too easy to overlook the ecology around us. We get caught up in the hustle and bustle of modern life and forget to stop for a moment and look at the world around us, until something unusual, something unexpected, catches our notice and pulls us out of our own heads and back into the world we share. One night last week my flatmate suddenly exclaimed “A fox!” and sure enough, there it was out the window — a fox casually trotting down the middle of Presentation Road. We watched it with a mixture of wonder and apprehension lest a car come around the curve too quickly. But it was late, and there was no traffic; the road belonged entirely to that lone fox, until she loped off into the grounds of the convent. Once it was out of sight, I checked the wildlife guide to find out how a fox could possibly survive in the heart of the city. Surprisingly, it turns out that urban foxes require much smaller territories than do their rural cousins. The protected areas of the Presentation and Poor Clares’ convents, so close together, plus the wild areas along the canals provide safe hunting and nesting grounds, and human refuse makes for an added bounty for such scavengers. It was a welcome reminder that even here in the middle of a city, we are inherently connected to nature. We lose that sense of connectedness at our peril, and at the peril of all around us. When nature is Somewhere Else or Something Else, it becomes too easy to ignore wildfires or badger culls or declining bee populations, to simply post a  and move on. But when we renew that connection every day — even if only with a wildflower growing through the pavement or a crow that teases us from a chimney top — we are more likely to take an active interest in caring for the world, because we understand that we are part of the world and the world is part of us. Finding our place in nature leads us directly to ourselves. Ecology really is all around us. It is the entire world around us, and our place there. Ecology is where we find it, and if we just take the time to look, we can find it everywhere.